From the moment an oil tanker arrived at the port of Valdez to load oil, every aspect of the operation had to be carefully watched to ensure a safe exit for the fully loaded ship. In this case several necessary procedures were ignored. On March 24, 1989, the tanker Exxon Valdez ran aground on a small island in Prince William Sound. In the days that followed, the ship spilled almost eleven million gallons of Alaskan crude oil into the water. The oil coated shorelines along the sound, and killed hundreds of harbor seals and otters, and thousands of seabirds. At Prudhoe Bay on the north coast of Alaska large deposits of oil and gas began to be intensively exploited in the late 1960s. By 1977 a nine hundred- mile long pipeline was completed, bringing oil to ports on the south coast where the milder climate permitted all year round operations. From the moment the first big tanker arrived at Valdez, a principal terminal for loading oil, there were environmental concerns. The ship channels along this coast are narrow and rocky and weather conditions are often bad. To make matters worse the tankers in service since 1977 were almost all old, with single hulls, not the double hulls that would be prudent in such stormy seas. The Exxon Valdez had a single hull. Oil is shipped from Valdez to refineries in Washington state and other places along the west coast as well as to Hawaii. The volume transported is huge. Alaska is the second biggest U.S. producer of oil, after Texas, and accounts for one quarter of the nation’s supplies. It is not surprising therefore that people were greatly concerned when Alaska’s oil first came on stream. Some spills occurred in the years between 1977 and 1989 but the Exxon Valdez accident became the villain that focused the anger of merchants and environmentalists alike. Fishing is a major industry all along the southern coast of Alaska and the amount of destruction to that resource was immense. The actual volume of oil that was spilled, though very large, was not nearly as big as other spills. The Amoco Cadiz accident in France, a little over a year before the Exxon Valdez, was more than six times bigger. The Gulf spill, two years after the Alaskan spill, was the world’s worst and was far bigger than Amoco Cadiz and Exxon Valdez combined. The unique problem surrounding the Exxon Valdez spill is the location. In the colder northern waters of Alaska, contamination lingers. The ocean takes a long time to absorb oil and every day or delay means death to many forms of marine life. The damage from the spill took years to eradicate and even after twelve years persistent problems remained to be tackled. The Exxon Valdez arrived at Valdez in the evening of March 22 1989. It was a big ship, longer than three football fields, able to carry more than fifty million gallons of oil. The tough work began early the next morning when the crew had to haul the delivery hoses from the oil terminal and start loading the cargo tanks. Water in the ballast tanks had to be released in matched quantities simultaneously in order to maintain the right stress levels within the ship. All the essential work was finished by eight o’clock in the evening and the crew was very tired. Federal regulations require that every member of a crew be given at least six hours of off-duty time within the twelve hours that precede departure. This rule was ignored because the company wanted to get the oil to market as quickly as possible. It was the first of several errors. By nine o’clock, only one hour after the ship was loaded, the Exxon Valdez was underway, guided by a pilot for the first few miles. Captain Hazelwood and his Chief Mate Kunkel were on the bridge with the pilot. Half an hour later the second of a series of errors occurred. In spite of standard guidelines requiring two officers to be on the bridge, Captain Hazelwood retired to his cabin for an hour and a half and shortly afterward his Chief Mate left to get some sleep. He was awakened two and a half hours later by the noise of the ship hitting the rocks. All this time, from nine o’clock to just after midnight, various people took turns on the bridge to let others catch some sleep. Shortly after eleven o’clock, in view of the arrival of large quantities of ice from the Columbia Glacier on the west side of Valdez Arm, Hazelwood requested and was given permission to alter his normal course to avoid the ice. What happened next is not clear. Hazelwood went back to his cabin again after giving orders to make course changes to avoid the ice. Several people were involved in carrying out these changes. Someone must have made a wrong turn because at one point a lookout shouted that the ship was on the wrong side of a navigation buoy. A radar station that normally monitors all departing ships until they are clear of the narrowest part of Valdez Arm had recently been downgraded as a cost-saving measure. It was unable to see the Exxon Valdez in those critical moments when it took the wrong turn and ran into an island. It may be that Hazelwood was unaware that the radar station did not see him and was counting on it to alert him to possible danger. Early in the morning of March 24 the Exxon Valdez hit the island and almost at once oil was seen oozing out from the ship’s side. Engines were stopped and not long afterward oil was seen spouting into the air from tanks. For twelve days oil leaks continued, then on April 5 special efforts were made to remove as much oil as possible from the ship before trying to do anything about the damage that was caused. Approximately 80 percent of the cargo was recovered, leaving eleven million gallons scattered along shorelines for one hundred and fifty miles. In the weeks that followed another three hundred miles of beaches, past Kodiak Island, were smothered in black oil. First concerns centered on the marine and shore life populations. The number of species affected was enormous. One reporter listed 120 different forms of life, some of them vital to the economic life of Alaska. They included salmon, otter, herring, halibut, whale, shrimp, sea lion, Arctic fox, Arctic loon, and bald eagle. Everywhere the oil came ashore one could see the dead or the dying among the myriad forms of life, from the tiny plankton to the big sea lions. A cleanup series of activities was soon launched, involving thousands of workers, more than 10,000 vessels, and a hundred miles of boom which was found in haste from all over the world. Larger birds were treated with tubes that were pushed down via their beaks into their stomachs to give them special food, often at the expense of severe bites on the faces of rescuers. Otters that were not too seriously hurt and abandoned otter pups were taken to shelters. Booms were mounted in numerous places to stop the flow of oil on to the shore and so protect salmon hatcheries and oyster beds. On top of all this activity there was a different kind of concern regarding migrating birds and mammals. Prince William Sound at the center of the oil spill is the world’s single largest stopping place for waterfowl. In summer this area is also visited by large numbers of humpback and killer whales. One year after the spill only a quarter of the normal volume of birds and whales appeared. 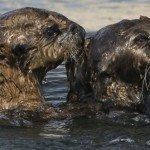 Ten years later estimates of loss included 3,000 otters and 300,000 birds. Only two of twenty-nine species examined in detail, bald eagles and river otters, seemed to have made a complete recovery. The cost to the oil company was immense and some environmentalists argued that the inevitable costs of cleanup may be the best way of ensuring that another Exxon Valdez spill will never occur. The ship was barred from ever returning to Alaska. Two billion dollars were paid out for the cleanup, most of it providing needed income for those deprived of their normal livelihood. Civil and criminal charges claimed another billion. Some of the legal ramifications were far from being settled by the year 2001. Alaska passed a bill requiring the oil industry to stockpile enough sup- plies to deal with a twelve-million-gallon spill. There were other bills dealing with reimbursement of people victimized by spills, monitoring of tankers, pipelines, and vessel traffic, and penalties for violation of the rules governing tankers. The U.S. Congress took action by raising the liability tonnage level for shippers to eight times its previous amount. Congress added a new five-cent-a-barrel fee to provide a billion dollar oil spill response and cleanup fund, and it also dealt with the problem of single hull tankers. Beginning in 1990, all new U.S. tankers must have double hulls and all those without them must be taken out of service over a period of time depending on their ages. Fortunately, not every oil spill in U.S. waters ended up as a major disaster. Lessons were learned from the Exxon Valdez experience and used subsequently in the Rhode Island spill. On January 19, 1996, an intense winter storm off the southern coast of Rhode Island drove the barge North Cape ashore adjacent to Rhone Island’s Ninigret National Wildlife Refuge. Damaged from the grounding, the barge spilled at least 828,000 gallons of heating oil, which rapidly spread to the coastal ocean. Within hours of the spill, dead marine organisms and sea birds began washing up on the beach. It quickly became the largest oil spill in the history of Rhode Island. North Cape, a barge loaded with oil, reached the southern shores of Rhode Island when it ran into a storm. The bad weather was not a surprise as it had been forecast, but the seaworthiness of the tug was much less certain. Shortly after leaving New York, while in the protected waters of Long Island Sound, it ran into engine trouble but was able to continue. As it entered the more open waters of Block Island Sound and encountered 60 mph winds with seas running as high as twenty feet, the tug seemed to stall. A fire broke out in its engine room as it approached Point Judith and the crew, after sending a distress signal, abandoned ship. Within minutes the tug was engulfed in flames. The Coast Guard picked up the men from the water. Barge and tug drifted toward the coast under pressure from the wind. Two men went aboard the barge and attempted to stop the drift by throwing out an anchor. That effort failed because the anchor could not be released. Within a few hours both tug and barge were aground on a barrier beach just west of Point Judith on Rhode Island’s southern shore and next door to the Ninigret National Wildlife Refuge. The next morning oil was visible on the water and there were the first marine casualties of the spill. In the following days, the magnitude of the event was evident. About 828,000 gallons of oil had spilled from the barge. As the oil spread from Block Island Sound toward Rhode Island Sound and Narragansett Bay, it forced a closure for fishing for an area of 250 square miles of ocean. This was Rhode Island’s worst ever oil spill. The stretch of water along Rhode Island’s southern coast is the regular path for all coastwise traffic to and from New York and the probability of an accident of this kind was always high. At any given time huge volumes of oil are passing nearby. Closure of fishing in a large area around Narragansett Bay was followed by other closures. Within a week ponds with lobsters, starfish, clams were all closed down and a general slump set in for all segments of the fishing industry. The barge and tug were finally removed but the damage had been done and little was to change for a long time. Heating oil is lighter than crude, the kind that formed the spills in Alaska and France, and its longlasting effects are accordingly less. In the short-term, however, it is much more toxic and so damage to Rhode Island was extensive and deep. The coastal environment impacted by this spill lies at the heart of the recreational and commercial fishing industries of Rhode Island. These industries are vital to the economy and lifestyle of the state, and the natural resources of the coast are a key draw for summer visitors. Residents are dependent on these renewable natural resources for fishing, boating, and hiking, as well as for a wide range of economic pursuits. When the livelihood of a whole community is tied to a particular natural thing as is the case here, the effects are felt throughout the state. One indication of this can be seen in the seasonal movements of people from farther north to southern coastal areas. Coastal areas are highly valued by these people and the felt sense of loss is great when a disaster of this kind occurs. The causes of this oil spill were twofold—poor maintenance of tugs and lack of care when dangerous cargoes are being transported in bad weather. Two years before this accident, a bill had been before Congress providing for the inspection, training, and ongoing supervision of tugboat operators. That bill was never passed. It may yet be revived in the light of this accident. Whether or not that will happen, the experiences in Alaska with the Exxon Valdez and in France with the Amoco Cadiz have already caused major changes in the rules governing oil spills and the resultant cleanup. In the aftermath of this spill, even though it was much smaller than the other two just mentioned, the new regulations and a new awareness of the seriousness of any spill made it much easier to rehabilitate a damaged environment and to do it in less time. Less than four years after the January 19, 1996, spill, much sooner than anyone expected, a full settlement was reached between federal authorities and the government of Rhode Island in July of 2000. It provided, among many other things, for the replenishment of the lobster populations. Costs of sixteen million dollars were awarded, most of it to be paid by the owners of the tugboat that caused the accident. The spill had killed nine million lobsters and more than 2,000 marine birds and was responsible for the lobster industry being shut down for five months. The habitat of the piping plover was endangered and about one million pounds of clams, oysters and other crustaceans were killed. To ensure a restoration of the Piping Plover’s habitat predator barriers were installed and a public education program launched to gain public support for the renovated habitat. As part of the same overall agreement with the state of Rhode Island, over a million female lobsters were to be added to Block Island Sound before the year 2005. These would gradually be purchased and introduced over time and all of them would have their tails notched with a “v.” It is illegal to harvest lobsters so marked. As a result, the number of adult females and the overall number of offspring will increase rapidly over the five-year development period. For the recovery of the shellfish industry ten million clams were added to specific habitats in Narragansett Bay and some coastal salt ponds. For the restoration of loons, habitats were restored and arrangements made to monitor nesting sites. In addition, a conservation site was purchased in nearby Maine where loons are known to nest. To improve fish runs obstructions on rivers or streams were removed to ensure easy access to salt ponds. On the day before the U.S. Department of Justice announced the multimillion dollar settlement, a damaged barge spilled 14,000 gallons of oil into Rhode Island’s Narragansett Bay, stirring memories of the far larger spill in 1996 into the Ninigret National Wildlife Refuge. Five swans had to be euthanized after becoming coated with oil. Another fifty Canada geese were spotted with oily feathers. Sixteen of these birds were captured and loaded on to a boat that has been converted into an animal rescue hospital. There the birds were washed clean of oil and given intravenous fluids to prevent dehydration. Government authorities assured everyone that the coincidence of the two events was purely accidental. Nevertheless it was a timely and vital reminder of the ubiquitous threat from oil spills.